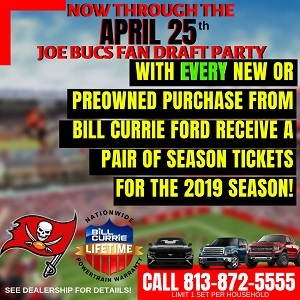 It’s that time of year, when Ira Kaufman steps away from his keyboard, puts down his beet salad and makes strong calls about the Buccaneers season. That’s what you get — and more — on today’s Ira Kaufman Podcast. 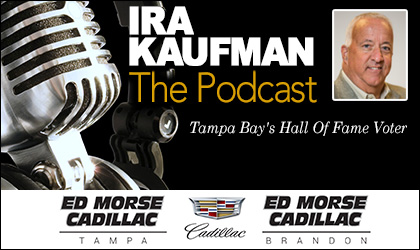 Always a fun and informative time, and it’s presented by Ed Morse Cadillac Tampa and Ed Morse Cadillac Brandon. Click play above or tune in at iTunes, Google Play or Podbean.com. Stay informed, thinking and smiling every single Tuesday & Thursday — and there is NO offseason. Click or download above. Listening to “The Sage” is fun, free and easy. Enjoy! So I promised to give the win probabilities based on Vegas projections. Unfortunately, the only futures game lines I could find were posted months ago, and that was mainly for publicity. And these lines are pre-suspension, so you have to adjust for that. The first game has gone from 7 to 9.5 or 10, an adjustment of 2.5 to three points. One could argue that our excellent play is an indicant of improved expectations. If so, Vegas hasn’t noticed. For a 3 point adjustment, we’ll be 10 point dogs to the Saints, 6 points to Eagles and 7 points to the Vikings. The “real” fans keep hearing the local media say how talented this team is!!!! Then they only compare the current roster to past Buc rosters!!!!!!!!!! When are we going to hear how the Buc’s roster stacks up against the other teams in the NFC South’s roster!!!!!!!!!!!!! #trust the coaches!!!!! Fix the “real” problem, the roster!!!!!!!!!!! Gambelero, aren’t the lines made to even the money laid? The wise guys don’t like losing money, so they hedge…right? I personally like our chances in all 3 games. With a decent run game and defense last season we’d have been 9-7. I know if my Aunt had balls, she’d be my Uncle, but it’s true. We’ve upgraded those spots, yet still the doubt from Vegas. We beat the Saints when they needed a win last season, so what gives? Wow Realist you have gone full blown Koetter/Smith shill mode. You were just as hyped up last year about how talented the roster was as everyone else. Loved the podcast and predictions. I agree with all of Lee’s predictions, in particular the Bucs defense being no better than 20th. That’s bold, but accurate. I’m glad you guys aren’t sunshine and rainbows like they are on the Buccaneers Radio Network.